Most music in the western world uses a particular tuning system known as 12-Tone Equal Temperament. Over the last 200 years and more, this system has proven effective and extremely practical. But infinitely many other tuning systems are possible, and the argument can be made that some other systems reflect more naturally the way our ears and musical brains perceive and interpret musical intervals. 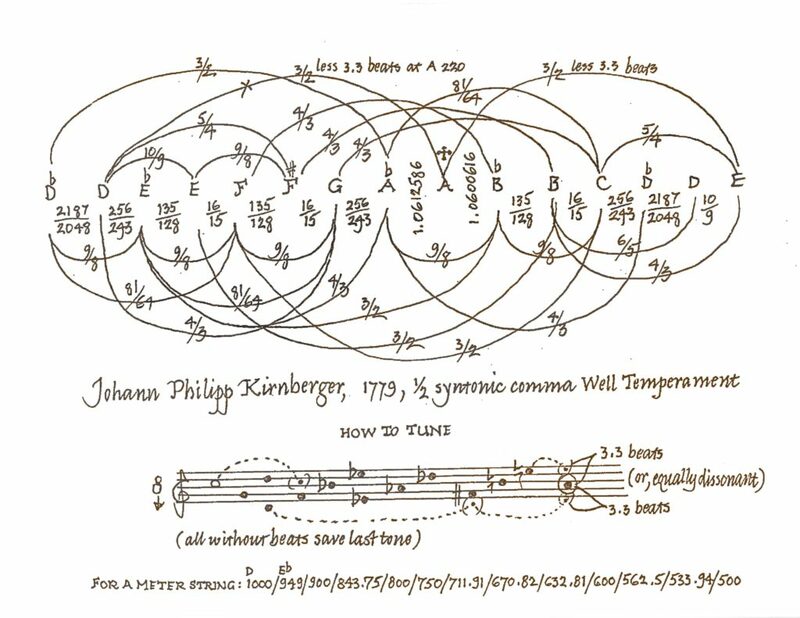 In the 1960s and ‘70s, a number of composers and theorists began exploring anew the possibilities for musical scales outside the realm of 12-equal. This was by no means a new idea, but these thinkers brought a renewed energy and focus to the subject that continues strong among musical theorists to this day. This exhibit celebrates five of the leading lights of that movement. The analysis of musical scales has its foundation in mathematics – a mathematics based on the frequencies of the pitches involved and the relationships between those frequencies. Scale analysis lends itself particularly well to geometric interpretation, with pitch relationships represented as spatial configurations. In the images displayed here, theorists and artists use graphics to illustrate the relationships and operations underlying diverse musical scales. Some of these images may originally have been designed primarily as diagrammatic and informational documents; others clearly were intended as art. In fact, all are both: in the mathematics of scale expressed as geometry, we find visual harmony. Lou Harrison’s music is characterized always by exquisite sonorities. Central to his pursuit of this quality was his concern with the particular tunings in which his works were to be realized. He did not seek exotic or revolutionary tunings so much as he searched for whatever tunings would be most right, most natural, most beautiful for the work at hand. Among other things, he had a particular interest in historical tunings – tunings developed before the dominance of 12-equal. It happens that Lou Harrison had a way with an ink pen as well (his calligraphy was beautiful), and this can be seen in the charts seen here representing early European temperaments. Harry Partch’s primary interest was in just intonation – which is to say, tuning systems based on ratios between whole numbers – and in broadening the tonal resources available to composers by expanding the range of ratios that listeners could accept as musically meaningful. In pursuing this he was “seduced” into instrument making, and in many of his instruments the implicit logic and geometry of the tuning systems was reflected as two-dimensional arrays in the spatial layout of the sounding elements. Many of his ideas also take shape as diagrammatic representations of pitch relationships, as can be seen in his pieces exhibited here. Tonality Diamond used by permission of Innova Recordings, from Enclosure Three: Harry Partch. Erv Wilson’s primary role has been not that of the composer, but that of one who creates the systems with which composers can work – or, more accurately, one who seeks to illuminate the tonal possibilities available to all. The mathematical organizing principals that underlie his explorations provide illuminating ways to think about scales of all sorts, and, beyond that, to think about an infinite, non-static universe of possible scales. He has represented his ideas in two-dimensional charts as can be seen in the graphics reproduced here, as well as three-dimensional physical models, and more abstractly as multidimensional spaces. Graphics courtesy of the Erv Wilson Archive, Kraig Grady, curator. John Chalmers has published extensively in the field of tuning theory, both as author of his own works and as founder of the journal Xenharmonikon. In recent years he has used computer graphic software to generate exquisite realizations of scale geometry as color images in print and on the screen. Each of his prints in this exhibit represents a particular scale, the image resulting from the functional relationships of the scale translated into location and color. Images courtesy of John Chalmers. More images can be found on the John H. Chalmers Facebook page. Ivor Darreg was interested in both just intonations (tuning systems based on the ratios between the frequencies of the pitches) and equal temperaments (tunings with pitches equally spaced through the octave, which require a different mathematical approach). He was fascinated by the unique aesthetic effect – the characteristic “mood”, in his word – created by each tuning. The charts included in this exhibit are representative of his tuning graphics. As an instrument maker he created another sort of tuning graphic in his Megalyras. These were two- or four-sided string instruments, playable with a slide, with the slide locations for various tunings laid out in full color along the necks. Original tuning charts courtesy of the Sonic Arts Gallery in San Diego, Jonathan Glasier, curator. The Window Gallery thanks the following people for generous assistance with this exhibit: Dennis Aman, Philip Blackburn, Steve Brock, John Chalmers, Jonathan Glasier, Kraig Grady, Charles Hanson, Larry Polansky, Ian Saxton.